﻿ Ryan Guzman: Actor • Model • The Boy Next Door » Official site of Hollywood Actor, Ryan Guzman. Ryan Guzman was born in Texas and shortly after moved to Sacramento, CA where he grew up. He played baseball in high school where he was ranked one of the best left handed pitchers in the state and continued playing at Sierra College. An injury ended his baseball career. For the duration of 2012, Ryan has rapidly been thrust into the Hollywood spotlight promoting Step Up Revolution. He now works on continuing to grow as an actor while also expanding on his new career and indulging his curiosities as a writer. 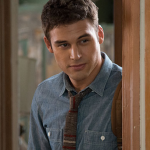 RYAN GUZMAN TALKS FILMING ‘THE BOY NEXT DOOR’ WITH J.LO & MORE!